"But the Monkey King was born for mischief...and offending the gods never gets old." "Does that clarity look suspicious to you?" Don't you hate those games where you're chasing down the enemy Monkey King who is at 100 HP, you turn the corner, and then he's gone? Is he on top of that tree? Is he the tree? 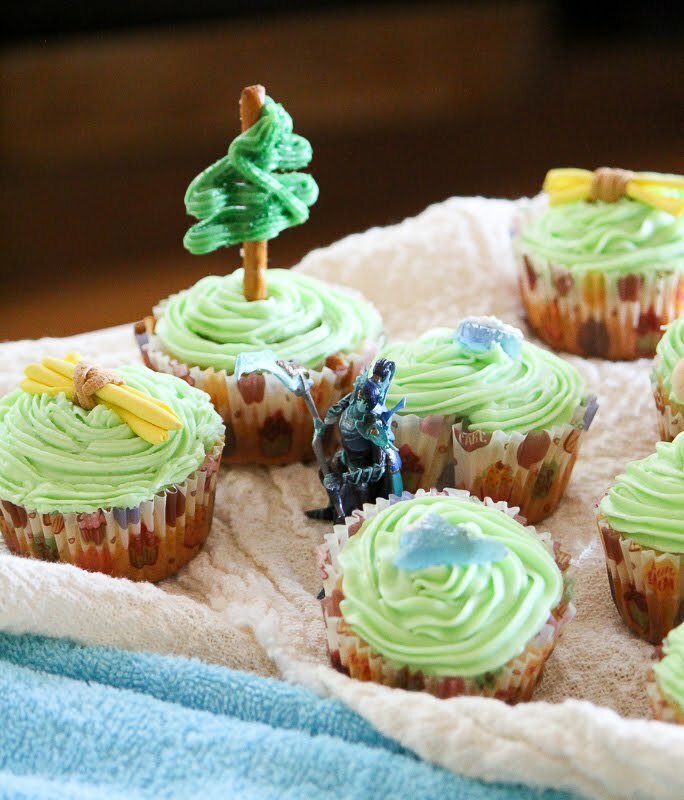 For the Dota 2 players who have spent far too long trying to get flying vision of Monkey King, and for the Monkey King spammers who love chilling out in iron branch form for the fun of it, these cupcakes are for you. 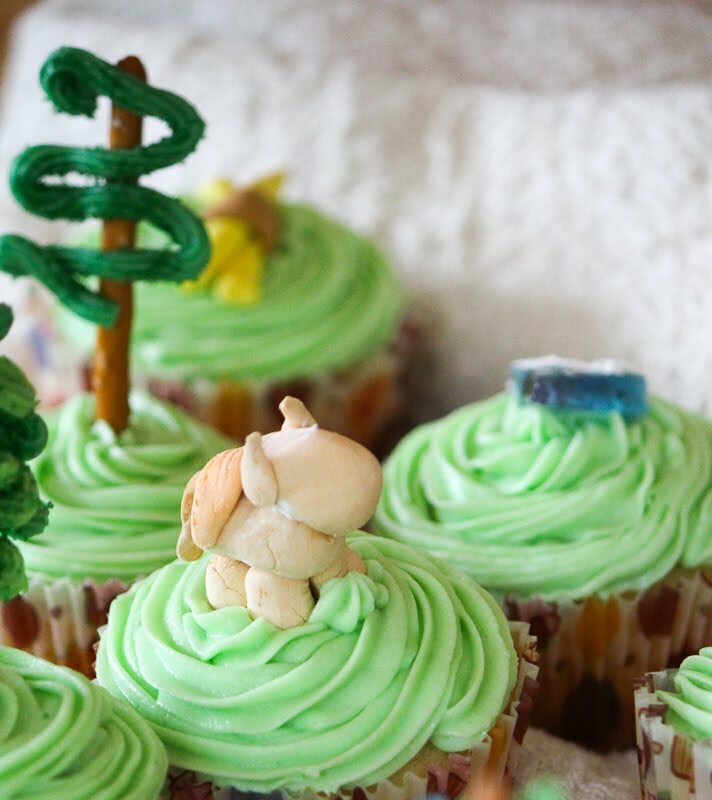 Each of these cupcakes is topped with an edible version of some sort of Monkey King mischief disguise: a hard candy clarity, a chocolate and pretzel tree, or fondant couriers and iron branches. But how do you know which of these are just innocent iron branches abandoned on the ground, and which are actually Monkey King in sneaky disguise? 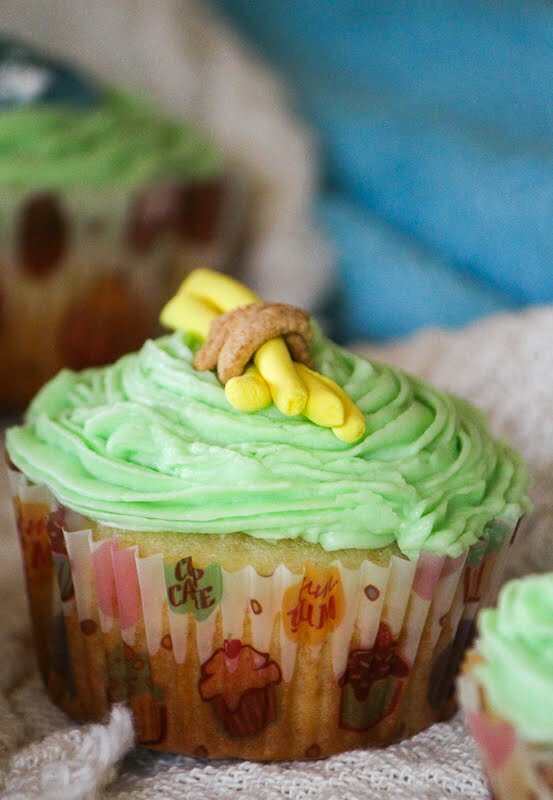 Half the cupcakes are secretly stuffed with banana ganache. Which was delicious. I was unlucky enough that neither of the two cupcakes I ate during my TI7 Grand Finals viewing party contained a Monkey King filling, but as the chef I got to lick the bowl after stuffing the cupcakes, at least. I suppose I could have stuffed all the cupcakes, but I think that would have defeated the purpose of the cupcake. 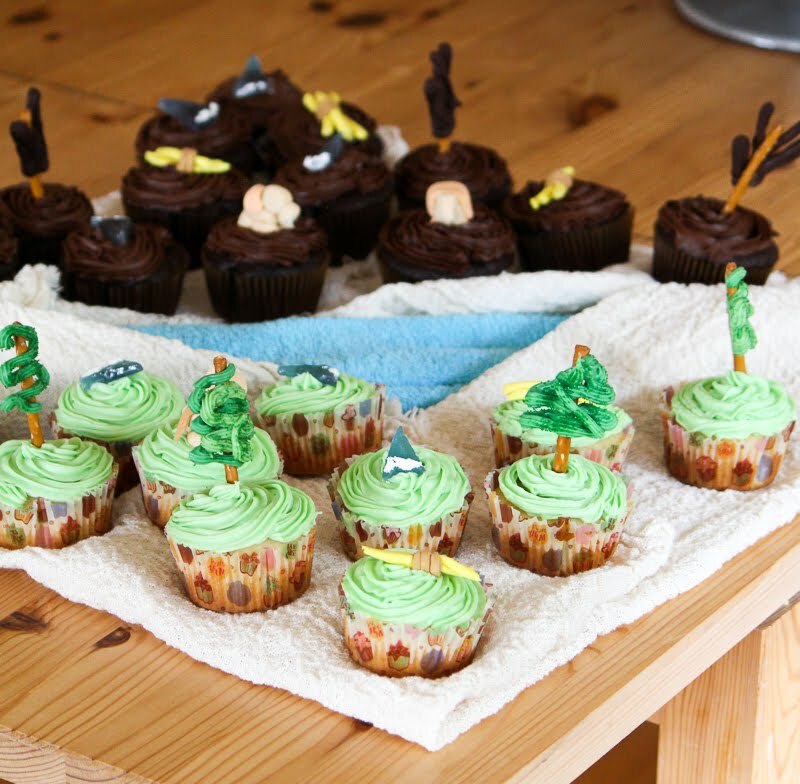 We arranged the cupcakes in the shape of the Dota 2 map. Half the cupcakes are vanilla topped with green buttercream frosting. The other half are chocolate cupcakes topped with chocolate buttercream frosting. Make clarities out of hard candy dipped in powdered sugar. Make trees out of pretzels and chocolate. Make couriers and iron branches out of fondant. Bake 12 vanilla cupcakes for radiant and 12 chocolate cupcakes for dire. With a paring knife, cut out a small cylinder 0.5 inches in diameter and 1 inch deep in 12 cupcakes selected at random. Spoon in the banana ganache. 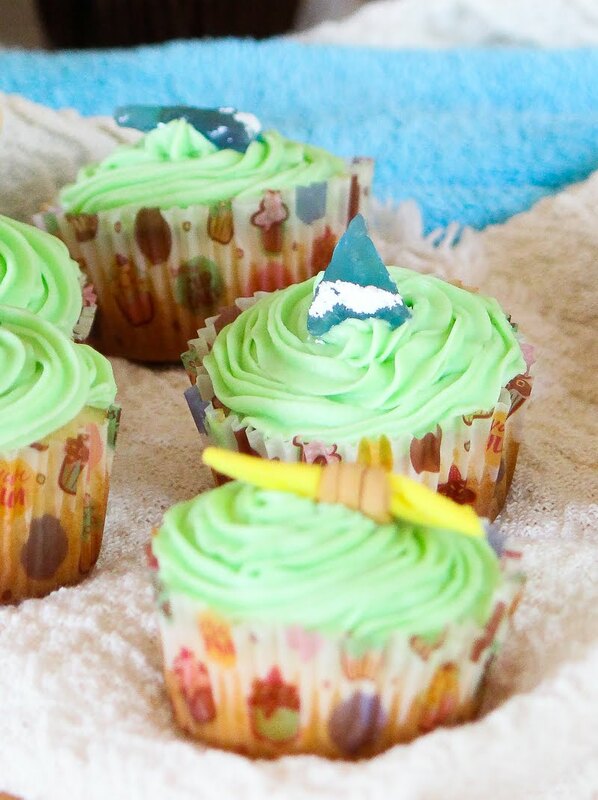 Top the radiant cupcakes with green frosting and top the chocolate cupcakes with chocolate frosting. Stick the cupcake toppers on top. 12 vanilla cupcakes: make them from a box, buy them at a store, or use whatever family recipe you inherited from your grandmother. 12 chocolate cupcakes: see above. 1 batch vanilla buttercream frosting, with 4-5 drops of green frosting coloring mixed in. I used this recipe. 1 batch chocolate buttercream frosting. I used this recipe. For the iron branches and the couriers, 1/4 batch fondant (I used this recipe) and food coloring in yellow, orange and brown. 1 batch clarity candy, recipe below. Chocolate Pretzel Trees, follow this recipe for Chocolate Pretzel Observer and Sentry Wards with the following modifications: (1) Omit the M&Ms. (2) For dire trees, pipe the chocolate into dead branch shapes instead of swirls. (3) For radiant trees, use white chocolate dyed with green oil-based food dye. Pipe the chocolate into a triangular zigzag shape. I also topped my radiant trees with green sprinkles. Mash the banana into a smooth paste. In a small sauce pan, combine the banana and cream, and heat until it begins to bubble and spit. Turn off the heat, then stir in the chocolate chunks. This hard candy recipe looks like blue glass - perfect for clarities! Dipping the bottoms in icing sugar is an easy way to mimic the white swirls at the base of the in-game clarities. This recipe makes far more than you will need, but it takes a bit of practice to break the candy up into appropriately clarity-sized shapes. You will very likely need a candy thermometer for this recipe. I have tried to make it without and I always miss the "crack point." You can make this several days ahead of time and store it in the fridge or freezer until you are read to break it up. Store away from heat and sunlight, or it will begin to melt and lose transparency. In a small sauce pan, bring the sugar, water and corn syrup to a boil, stirring to dissolve the sugar completely. Continue to apply heat without stirring. Check the temperature regularly. Once the temperature of the sugar solution has reached 295ºF/145ºC, add the food coloring and any flavoring. Stir in quickly. Keep heating the mixture until the temperature hits 300ºF/150ºC. Remove from heat and pour into the lined baking pan. Don't worry too much about the bubbles, they rose to the top and disappeared for me. Allow the candy slab to cool until hard. Remove the parchment paper from the pan and pop it in the freezer for at least half an hour, or for as long as a week. Unfold the parchment paper from the candy on a cutting board, keeping a layer of parchment paper between the cutting board and candy. Do not handle the candy directly, keep a few pieces of scrap parchment paper handy for gripping the candy. Anything sticky, like cling film or fingers, will mark the glass-like surface. Sticky fingers also make knife wielding more dangerous. Score the candy with a very sharp knife or a clean x-acto blade. Keep to straight lines, don't try anything too fancy. Grip the candy on two sides of a score and snap it. Repeat this process until you have around 6 1.5-inch triangles. Dip the base of each triangle in powdered sugar. This was my first time working with fondant. And it was... fairly successful I think? If this is your first time too, gg branches are actually a great introduction. The couriers turned out a little derpy, but I think that was half the appeal. (Or at least that's what I'm telling myself.) Think of this as play-dough for adults that like baking. Ready your workspace: have on hand way more powdered sugar than you expect, several tooth picks and all the colors you think you may need. Keep your hands and work surface coated with a thin layer of icing sugar to prevent sticking. Take a small ball of fondant, and massage it briefly to soften it. Dip a toothpick into yellow gel-based food dye and wipe it on the ball of fondant. Continue kneading the fondant until the color is evenly distributed. Pull off a marble-sized chunk and roll into a thin cylinder. Slice it into 1.5-inch lengths, and arrange into bundles of 3-4 sticks. Continue until you have enough branches. Take a smaller ball of fondant and similarly dye it with brown food dye. Repeat the process above to make a little brown cylinder. Slice it into 2-inch lengths, and press each length with your fingers to flatten them. Wrap a brown strip around each bundle of sticks (inb4 OP is a bundle of sticks jokes). Line a cardboard box with parchment paper. Let the iron branches dry in the cardboard box until you are ready to top the cupcakes. For the couriers, I essentially followed this youtube video, but did without the toothpicks. To "glue" the legs and body together, I instead wet my pinky finger in the tiniest of water drops, then dipped my finger in some spare powdered sugar to create a paste. I then dabbed this onto each leg, and gently pressed the body onto the four legs. Let this dry for a few minutes before moving it anywhere. The courier body is a pale brown, the courier tails are darker brown, and the saddle is a little fold of orange fondant. Check out the spread from The International 2015, from The International 2016, or from The International 2017!